A pallet jack is the most basic type of forklift. They perform best when used to transport long distances either full or partial pallet loads. Other operations that use pallet jacks and pallet trucks include loading and unloading trucks, low-level order picking. 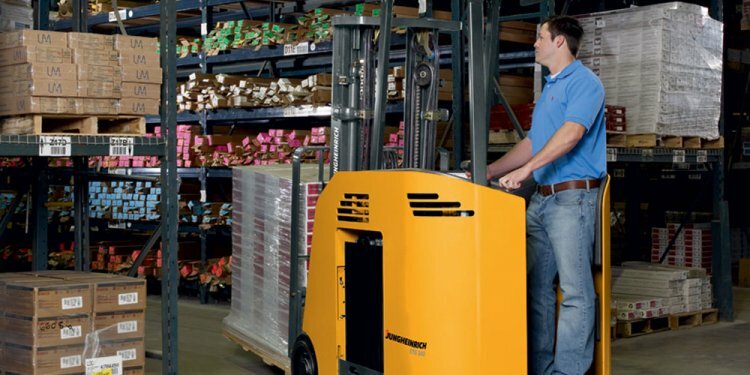 Pallet jacks and pallet trucks are categorized as Class 3 trucks in materials handling. The difference between a pallet jack and a pallet truck is quite simple: a pallet jack is driven manually, while a rechargeable battery powers a pallet truck. There are two common types of pallet trucks: a walk-behind and a rider. Walkies, as they’re more frequently called in materials handling, can be either manual or powered. Electric pallet trucks top out at a speed of about 4 miles per hour and have a load capacity between 4, 500 and 6, 000 pounds. Forks can range from 32 inches to 60 inches – or one to two pallets deep. Since these lift trucks don’t go very fast, they are the ideal for dock work that involves loading and unloading trailers at short distances. They also work well for light duty, low-level order picking. Riders are meant for higher speeds and longer distance. The operator stands on a platform and directs the truck with a handle or tiller. Riders top out at a speed of about 9 miles per hour unloaded and have a load capacity between 6, 000 and 8, 000 pounds. Forks can range between 36 inches to 144 inches – or one to three pallets deep. A rider works great for order picking at low levels for multiple pallets using longer forks. A rider is also commonly used as part of a system. A less common type of pallet truck is the center-rider truck. These are used to increase productivity and pick orders from both sides of an aisle. Center riders are also used to transport larger, bulky items on long runs. Pallet jacks and pallet trucks are efficient general-purpose trucks, but are not suited for all warehouse needs. Pallet trucks are not appropriate for unit load storage or retrieval above the floor level in a rack system, unit load bulk storage and retrieval above ground level or order picking above the first beam. Although pallet jacks and trucks are basic, they can still be customized. A variety of load capacities and different fork lengths are available can make all the difference in your warehouse operations.